These resources are always available and unlimited. The power based on deceit and manipulation will yield only a limited kind of support. When it meets an obstacle based on hope and light, it knows it is doomed. 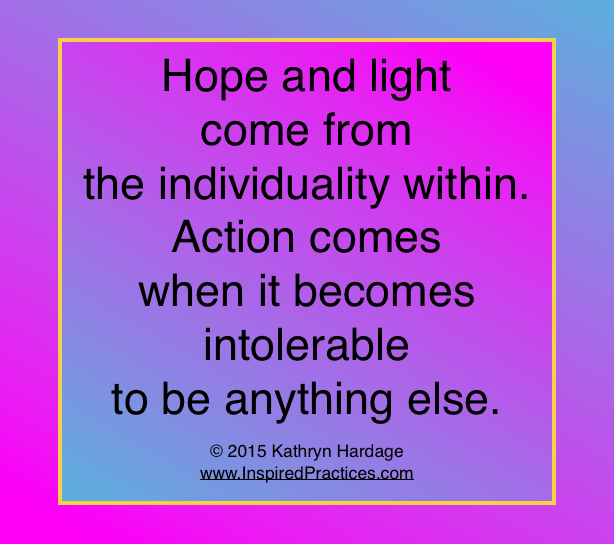 Hope leads to thoughts of solutions, community, individuality, value. We all know who we are deeply, inside. When we listen to that feeling, we are guided to act on the things that bring hope and light. Because the deep identity is always there, nothing can ever take it away. We naturally express that identity and its light. We learn to take action when it becomes intolerable to be anything else. We are drawn to those who know that feeling and know its power. That is how we change our world.